Eastbourne has many attractions for all visitors. There are four theatres, two cinemas and a wide variety of restaurants and bars which cater for all tastes. We will be happy to make any reservations you may require. the historic local villages nestled amongst the South Downs. 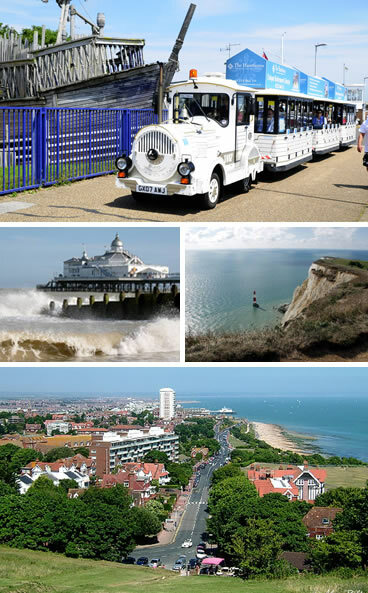 Eastbourne in East Sussex is the start of the South Downs National Park so where better to stay than at Devonia Bed and Breakfast before going exploring. London is only 90 minutes away by train. In June the pre-Wimbledon Tennis Tournament takes place at the Devonshire Park Tennis Centre. the Red Arrows and plenty of entertainment for everyone. Whilst staying at Devonia Bed and Breakfast in Eastbourne there is plenty to entertain you locally, but the surrounding areas including the city of Brighton are only a short journey away making Devonia an ideal place to stay.